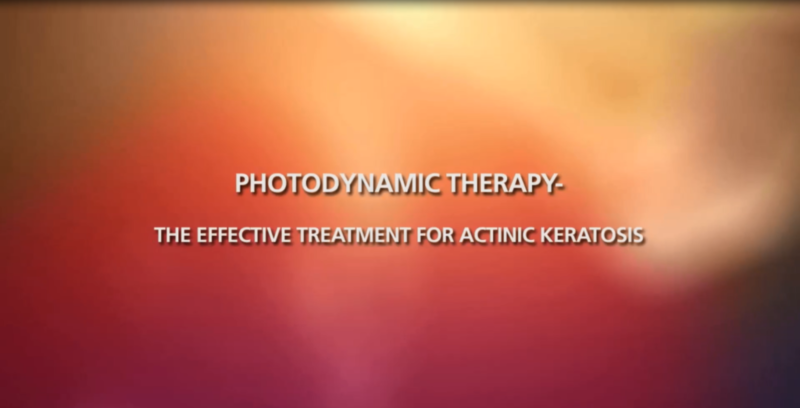 Photodynamic therapy (PDT) is a highly effective, non-invasive, irradiation-free light therapy to treat AK, performed by a healthcare provider. In principle, it uses light and a photosensitizing (i.e. making something sensitive to light) gel or solution. A preferred photosensitizing substance is aminolevulinic acid (ALA), a naturally occurring precursor of protoporphyrin IX (PpIX), the photoactive (i.e. activated by light) substance. Once inside the cell, ALA is converted into PpIX by a series of enzymatic reactions. PpIX is activated by light in the presence of oxygen, resulting in the elimination of AK cells. Aminolevulinic acid is primarily absorbed by premalignant cells, leaving healthy skin cells mostly intact. Which light source is used for PDT? In general, PDT can be performed with different light sources. Although the human eye is not able to see the different colors in daylight, seemingly “white” visible light contains a broad range of different wavelengths, with spectra of red, yellow, green and blue light. 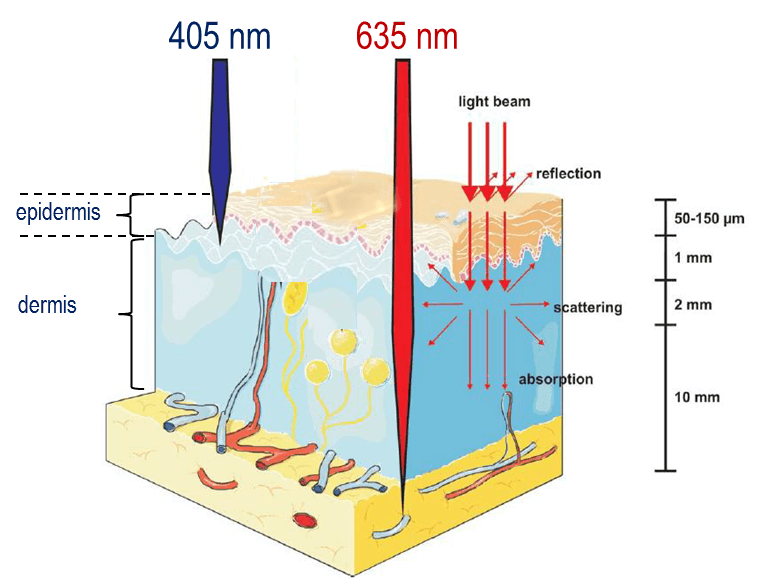 The red light of the BF-RhodoLED® lamp activates the photosensitizer at a wavelength of 635 nm, targeting actinic keratoses in the entire epidermis. How is PDT done with Ameluz® (aminolevulinic acid hydrochloride) gel, 10%? Once your AK diagnosis has been confirmed by a doctor, and you and your doctor have decided on PDT with Ameluz® (aminolevulinic acid hydrochloride) gel, 10% your skin will be prepared for the treatment. Ameluz® should only be administered by a healthcare provider. Initially the skin is degreased with alcohol to cleanse the treatment area. After removing scabs of more moderate actinic lesions, Ameluz® is applied to the affected skin. Special care should be taken to avoid bleeding during lesion preparation in patients with inherited or acquired coagulation disorders. Direct contact of Ameluz® with eyes and the mucous membranes should be avoided. Ameluz® should be applied at a thickness of 1 mm. No more than 2 grams (one tube) of Ameluz® should be applied at any one time. Larger skin areas may be treated separately or in two office visits. To avoid a premature reaction, the treatment area is covered with a light occlusive dressing, a process called occlusion. 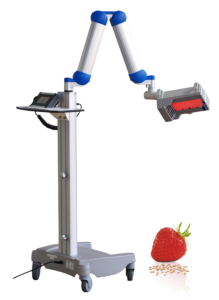 After an incubation period of 3 hours the occlusion and any remaining gel is removed, followed by illumination with the BF-RhodoLED® lamp for 10 minutes. Eye exposure to the BF-RhodoLED® light must be prevented. Patients, healthcare providers and any person present during the illumination period must wear protective eyewear before operating the lamp. Avoid staring directly into the light source. 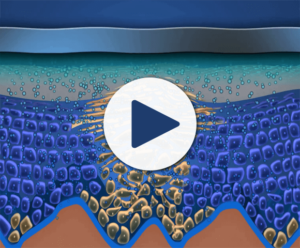 After the treatment, patients should avoid sunlight, prolonged or intense light (e.g., tanning beds, sun lamps) on lesions and surrounding skin treated with Ameluz® for approximately 48 hours following treatment, whether exposed to illumination or not. What to expect during and after the treatment? Local skin reactions at the application site were observed in about 99.5% of patients. The sensation of pain and other frequently observed adverse reactions include reddening of the skin at the application site, burning, irritation, swelling, itching, scaling, crust formation, hardening and blistering. Most adverse reactions occurred during illumination or shortly afterwards, were generally of mild or moderate intensity and lasted for 1 to 4 days in most cases. In some cases, however, they persisted for 1 to 2 weeks or even longer. Severe pain/burning occurred in up to 30% of patients. Cooling of the treatment area during and after PDT usually reduces the symptoms. The healing process usually takes a few days. However, some signs may remain for up to a couple of weeks. Once the crusts are gone, the skin appears smooth. The final results of the treatment will be examined by your doctor three months after your first PDT, to determine if all AKs have been eliminated. If any AK remains, a second PDT should follow. It was demonstrated in clinical trials that about six out of ten patients treated with Ameluz® and the BF-RhodoLED® and did not require a second PDT. About 9 out of 10 patients who received one or two treatments with Ameluz were completely cleared of their AKs. Treatment and healing process. Fluorescence imaging (left) after 3 hours of incubation with Ameluz® visualizing premalignant fields of actinic damage. As the healing process begins, crusts may form (middle). Once the healing process is complete, the skin appears smooth (right). Uses: AMELUZ® gel, a porphyrin precursor, in combination with photodynamic therapy using BF-RhodoLED® lamp, is used for lesion-directed and field-directed treatment of actinic keratoses of mild-to-moderate severity on the face and scalp. Known hypersensitivity to photoactive substances known as porphyrins. Known hypersensitivity to any component of AMELUZ®. Porphyria (hereditary disease that is characterized by abnormal production of a red blood pigment called heme). Photodermatoses (skin conditions caused by or made worse by exposure to light or ultraviolet radiation). Transient Amnestic Episodes: Photodynamic therapy may cause transient amnestic episodes (temporary loss of memory). If observed, the therapy must be stopped immediately. If observed after treatment, contact your health care provider. Risk of Bleeding: Special care should be taken to avoid bleeding during lesion preparation in patients with inherited or acquired coagulation disorders. Bleeding must be stopped before application of the gel. Ophthalmic Adverse Reactions: Avoid applying AMELUZ® into the eyes. Wash eyes with water in case of accidental contact. Mucous Membrane Irritation: Avoid direct contact of AMELUZ® with the mucous membranes. Wash with water in case of accidental contact. Concomitant use of the following medications may increase the intensity of adverse reactions after light exposure related to photodynamic therapy: St. John’s wort, griseofulvin, thiazide diuretics, sulfonylureas, phenothiazines, sulphonamides, quinolones, and tetracyclines. Most side effects occurred during illumination or shortly afterwards, were generally of mild or moderate intensity, and lasted for 1 to 4 days in most cases; in some cases they persisted for 1 to 2 weeks or even longer. Pregnancy Warning: There is no available data on AMELUZ® use in pregnant women to inform a drug associated risk. Lactation Warning: There is no available data regarding the presence of the active ingredient (aminolevulinic acid hydrochloride) in human milk, or the effects of aminolevulinic acid hydrochloride on the breastfed infant or on milk production. Pediatric Warning: Safety and effectiveness in pediatric patients below the age of 18 has not been established. Geriatric Warning: No overall differences in safety or effectiveness were observed between older (65 years and older) and younger patients, but greater sensitivity of some older individuals cannot be ruled out. AMELUZ® is administered only by a health care provider. AMELUZ® is for topical use only. Retreat lesions that have not completely resolved 3 months after the initial treatment. Inactive Ingredients: xanthan gum, soybean phosphatidylcholine, polysorbate 80, medium-chain triglycerides, isopropyl alcohol, dibasic sodium phosphate, monobasic sodium phosphate, propylene glycol, sodium benzoate and purified water. Other Information: Store in a refrigerator, 2°C – 8°C (36°F – 46°F). Excursions permitted to 15°C – 30°C (59°F– 86°F). The risk information provided here is not comprehensive. To learn more, talk about AMELUZ® with your health care provider. The FDA approved product labeling can be found at https://dailymed.nlm.nih.gov/dailymed/drugInfo.cfm?setid=650daa9f-aeec-49ce-95b9-5fa20b988afd. You are encouraged to report side effects of Ameluz®. Please contact Biofrontera Inc. at 1-844-829-7434 or FDA at 1-800-332-1088 or www.fda.gov/medwatch.